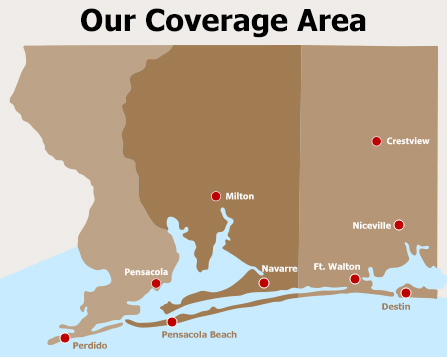 Our main office is located in Pensacola, Florida and we have been surveying land on Florida’s Gulf Coast since 1989. In that time, we have completed thousands of surveys in Escambia, Santa Rosa and Okaloosa counties, and have never missed a scheduled closing date. We would be proud to provide a property survey for you. Our approximate turn around time is 3 to 5 business days from the time of confirmed order, weather permitting. If there are special circumstances, our schedule can be re-arranged if at all possible. We work very closely with title companies in all three counties to ensure a fast and reliable closing. Prices vary depending on the type and location of work needed. Our land survey costs are moderate compared to other property survey companies. Ask about special rates and packages on professional land surveying for builders and construction companies. If we cannot do your survey due to time constraints, we can recommend someone who may be of help. Proof of insurance and certificates of insurance can be furnished upon request. We are always accepting applications for Party Chief & Rodman. If you are a Jr. Party Chief or Rodman and want to move up in your career, we encourage you to come fill out an application to be considered for employment with our company. © Copyright 2019 Lands' End Surveying. All rights reserved.